Choosing to buy a new car is a huge process to undertake. Of course, choosing the right car itself is already a troublesome ordeal. You have to choose between the newest of the new and the older cars, trying to balance functionality with your budget. On top of this, looking for a reliable car salesperson can also be a hassle. Trying to find out the reputation of every person who is trying to sell cars is time-consuming and very tiring. This is one of the many reasons why people will turn to dealerships instead of someone who is selling a car locally. There are many, many more reasons why you should consider getting your next car from a dealership. When you are looking at car dealers in Canberra, there are several key points to look at. For instance, private dealerships and branded dealerships will sell cars of different qualities. You can’t always get a brand-new car that still has its factory sheen on it from a private dealership. Similarly, private dealerships don’t always have the same standards as branded ones. Private sellers have even fewer standards that they have to live up to. This is another reason why people often prefer branded car dealerships when they are searching for their next cars. Aside from this, there are a few other things you will need to consider. Arguably, one of the most important things to look at is the reputation of the cars being sold. You can often get this information by looking at the reviews that a particular dealership has. You can also get a good idea of the standards a dealership has through what kind of dealership they are. Private car sellers often have the fewest standards to hold up, making it risky to purchase cars from them. Private dealerships have a business to run, meaning that there might be a few standards that they uphold but there is no guarantee that your car will be flawless. On the other hand, branded car dealers have the entire reputation of their brand to hold up. If word got out that such a dealership was selling poor-quality cars, the popularity of the brand would drop, which would not be good. 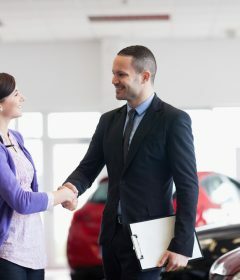 Because of this, branded dealerships often have some of the highest standards for their cars being sold as these cars are the building blocks for their reputations. This means that you can often trust a car from a branded dealer. Why Should You Consider a Car Dealership? Beside the fact that branded dealerships have a huge reputation to maintain, there are a few more reasons why you should consider a dealership. Dealerships often have a wide variety of cars for you to choose from. From used cars to ones that are brand-new, you will have many options to choose from. This will make it easier to find your next car. Many dealerships also offer car servicing for cars that you have purchased from them, particularly branded dealerships. This will also make it easier to get your car repaired if something happens to it. With less hassle when it comes to repairs and a wide selection of high-quality cars to choose from, going to a dealership for your next car is one of the best things you can do for yourself.